"Do you think Bonnie ls lying?" my wife asked me last night, immediately after the character claimed to have reversed her ancestor's spell. "No way," I replied. "That would be extremely traitorous." Serves me right for trying to forecast what's ahead on The Vampire Diaries, a show that continually throws twists and turns at its viewers, layering characters with new sides and agendas, all of which make sense in the grand scheme of things. John Gilbert is Elena's father! Did anyone see that coming? I was so busy thinking mean thoughts about Isobel that, unlike Damon, I didn't put her story together. This tidbit spun Isobel's return to Mystic Falls and her icy attitude in an entirely different direction. She actually has Elena's best interests in mind. We got a glimpse at her humanity, which she claimed didn't exist (and which Damon explained to Alaric in a nice conversation between the two frenemies, one that referenced Stefan's desire to "feel How I Met Your Mother." Ha! ), when she compelled Alaric to get over her and returned his ring. But during her episode-concluding phone chat with John, we learned that it was all an act. Or at least most of it (that gay cowboy and waitress were certainly legit). Isobel simply doesn't want her daughter to live among vampires. Her and John "owe" Elena that much. If we can remove our knowledge of Stefan and personal affection for him, it's hard to blame a mother for taking that stance, isn't it? Speaking of affection, there was movement on the Delena front. 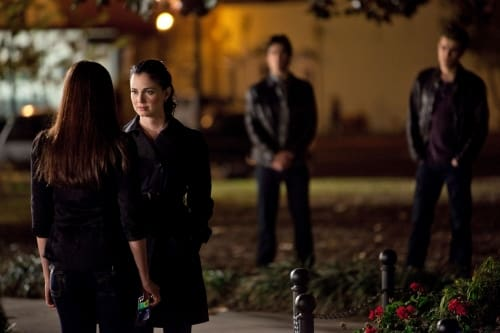 After Isobel outed Damon's love for Elena, Stefan confronted his brother. But he wasn't just concerned about Damon's feelings, was he? Stefan noticed a couple glances between his girlfriend and his sibling earlier in the hour. He must suspect that a real bond has formed between the two. It was also great that Damon didn't deny Isobel's accusation. He smiled his usual, mischievous smile and he sort of said he wouldn't pursue Elena - but his reaction confirmed what he must not have thought could have been possible a couple months ago: Damon loves a human. Finally, we get to Bonnie. The show has done a masterful job building this character into an integral player in the story, after we complained initially that she was the most boring witch of all-time. Can you blame Bonnie for lying about the curse? Her closest relative is now dead, thanks to the presence of vampires in Mystic Falls. Her judgment is not clouded by love for a blood sucker, as one could argue Elena's has been. Like Isobel, Bonnie sees the danger these creatures can cause. And that's the appeal of The Vampire Diaries. Nothing, and no one, is black and white. Looking ahead to the May 13 finale, we hope John doesn't go through with his plan to kill Stefan and Damon, that's for sure. But if this somehow happened, we could understand why. That's an impressive feat for the show to pull off.